Too wild for the wildlife!! Okay...so maybe there isn't really too wild for the wildlife but something had to be done!! I pride myself on have a little area for the wildlife but this had just got ridiculous!! There's supposed to be a pond and herb patch...not to mention fruit bushes and manure heap....now I just have to find them!!! managed to find the pond. heap was once again revealed!! a place among all those weeds!! So after an hour of cutting, tugging and pulling I have something that resembles more a wildlife patch and less of something that resembles sheer neglect. You can even actually walk on the slab path now and see the shed as you approach. It isn't the best it can be but it is a huge improvement and I am more than happy with that little hours work. below is the final photo I took as I left. Do you see it?? My Hubby really couldn't!! 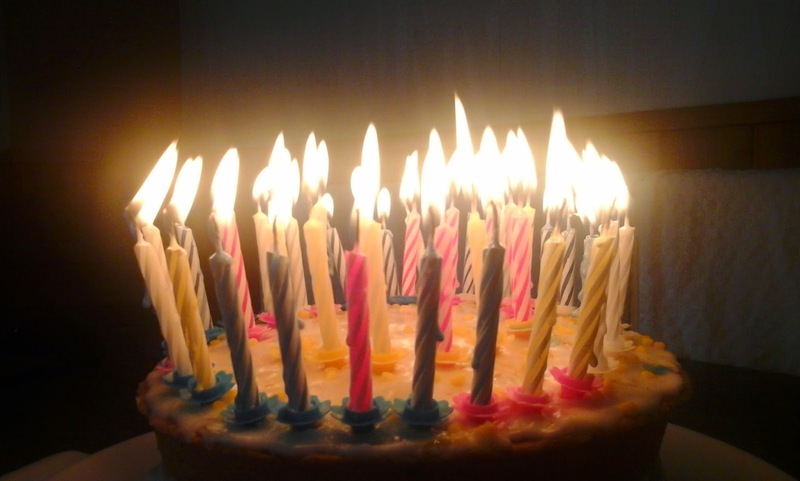 the right amount of candles on!! Did you manage to count them?? 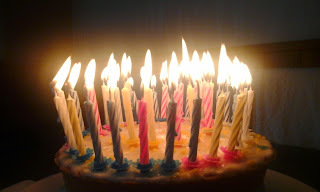 My Brother-in-law made my cake and it was delicious, I really don't know how he gets his sponge so light and delicious!! Want to see my cards?? Now can you guess how old I was?? Just lick on the photo to enlarge it! 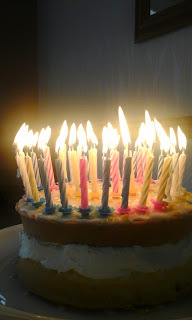 I'm told by the children that is was a 'big' one...honestly I don't feel any different at all!! I'm not much of one for names but I know it's a Pandora ring because the box told me!!! I do love ti though and amazingly it fits!! From Eva (next door) Benjamin and Suny. I don't tend to have house plants as I'm not very good at keeping them alive and had to do a little research to find out what I should do with it. Anyway I have decided to keep it in the bathroom with my bonsai tree and aloe plant...hopefully it will get plenty of moisture there, plus I do go to the bathroom several times a day and the tap is handy for me to remember to water it. I do like having them on the bathroom windowsill...it really adds a lovely atmosphere to the bathroom!! Besides the above I also got a kindle fire which is wonderful. I have the very first kindle which was made but this one is a lot easier to navigate and with it being in colour will be great for me to get some more research books on for gardening and the bees at a fraction of the price too!! I got some other lovely gifts too including a necklace, books, boodles yarn, writing set, outdoor lantern, gardening gloves, wind chime, cardigan, DS game, a small rucksack and a lovely bag that my sister knitted me. Not bad for an oldie!! So I went down the allotment yesterday afternoon and finally got in the main crop potatoes. Main crop potato bed, King Edwards. So above you can see how lovely it looks. Believe me it took some time getting it to this particular state. It was very weedy and solid when I arrived so had to be dug, rotorvated and manured as the potatoes went in but it is now done if maybe a little late. I'm not worried though, they will grow and I am hoping for a wonderful crop of King Edwards at the end of the summer. As you can see the new potatoes are doing well and I will get them 'hilled up' this week some time as I choose not to hill my potatoes up until after they have come through. I find this helps keep on top of the weeds and means they don't go astray of the hills. Whilst there id also did a little breaking up of earth in the brassica bed in preperation of weeding and planting. I also had a close look at a couple of the fruit trees. All the trees have set fruit now, some more than others so I will be keeping an eye on them and possibly thinning out the fruit as I think the pear tree especially has far too much fruit on it and I don't want to risk the branches splitting!! Re-discovering the Bee plot pond. Well as eve it has been a while for me posting but I am just going to get on with things and try and sort out some decent posts from the pics. I have. First off I am taking you back not too far...just to Friday 22 May in fact when with a little help from the Boy and Trojan we again found a pond on the bee plot!! so measures had to be taken!! Here you can see the bee hives...well just! and a sense of privacy for the bees. that I took the photo from inside the shed!! tidying may be done but not too much. although he did tie himself up a couple of times! So that's it for this post...I figure short and sweet is best!! Come back tomorrow for a celebration or two!! Not a lot of anything. So nothing much has been happening down the allotment. I came down with a stinker of a cold the middle of last week which left me with a sore throat and a bit chesty. Nothing so serious that I had to take time off work but it certainly took it out of me and with the weather being changeable at best I figured it was best not to do too much down the allotment and make myself worse. I have of course popped down to water the greenhouse and whilst there last Friday I thought I would just pop over to the bee plot...what I found there was a little busy to say the least!! The right hand hive was absolutely heaving and the bees were fighting with each other to get in and out, knocking the pollen out of there baskets and just generally in a frenzy. I knew I couldn't leave them like that so got kitted up so that I could remover the entrance block which would give them more room to get in and out and whilst I was at it though I would take a quick look in the hive to see what was going on. Of course the weather wasn't great so I knew it would only be a quick look and was disappointed to see some capped swarm cells in the brood box. This meant the the original queen should have already swarmed out with a load of the bees but to be honest there were that many bees present that I didn't think it was likely...I guess the bad weather did have it's good points as it meant the bees didn't think it was fit to swarm. With no frames made up all I could do was close the hive back up...collect some equipment to take home to build up and pray!! So Saturday morning had me building frames and getting sorted ready to do some swarm control but the weather was that cold and windy I knew there was no chance of getting in the hive. 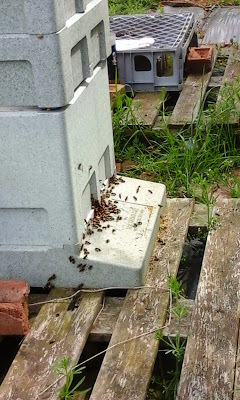 Anyway with the frames built I went to the allotment and my heart dropped when I saw how little activity there was outside the hive....surely they swarmed on Friday afternoon??? Maybe they were just being lazier due to the cold?? Didn't matter what I surmised I wasn't going to find out on Saturday in the cold wind!! So that took me to Sunday and although the weather wasn't great I wasn't going to miss the little bit of sun and warmth we had and so I went up the allotment...donned my bee-suit and opened up the hive. To my delight..the bees hadn't swarmed and I managed to locate the queen and carry out swarm control. What does this mean?? I now have two hives and a nuc on the go. Of course I have to hope that the new queen hatches out and mates successfully in order for this to work but if for whatever reason she doesn't I can just merge the old queen and other bees back in with her and I am no worse off. So fingers crossed it all goes well. I wasn't sure how much you would really want to know about what you do when the bees are likely to swarm and why so haven't covered it too much here but if you want to know more then just follow this link to learn more about what I did!! Incidentally although I'm not up to full health yet I am feeling a lot better than I did and will hopefully get a little more done down the allotment this week. I love that movie, 'Notting Hill' especially when Hugh Grant says this line...more than once I might add...having said that though this is a saying I said many times before watching the movie. But I digress...so what was my oopsy??? so you see how many of my brassicas germinated?/ This was my 'oopsy' you see I watered the top but forgot to check the watering can rose first and a little bit of silt in ti caused water to pour out rather abruptly and push the compost and seeds all over...the one you see above is the only one so far to have germinated. I'm thinking I need to sow some more!! So I showed you everything I had got done the other day and It's looking great if I do say so myself. However....there is still plenty to do so here are a couple of still neglected areas I have yet to tackle!! There are another couple of spots that need work but these are the worst. As you can see the autumn raspberries didn't get cut back last year so I am wondering whether I should still cut the dead wood out or just leave them now until the end of the year?? Any suggestions?? The brassica bed will be another potato bed and this will hopefully happen over the weekend so that the King Edward potatoes can go in. My other task this weekend will be to make sure the strawberry bed doesn't have to share it's space with dozens of dandelions for much longer. Well I have been meaning to post for a long time but things have just been majorly hectic. Anyway I'm here now so will share a few things with you and then save some for later in the week...after all don't want to bore you all outright!!! So plenty of work has been taking place down the allotment....crops are in the ground and things are coming on nicely in the greenhouse. I really worked my fingers to the bone last week with the promise of some major rain which never quite reached us although it did make up for it this Sunday...which I suppose was typical for a British bank holiday weekend!! That's all I'm going to say about it...now I will just share some photos!! a variety of peppers and broad beans. So as you can see I have got some things done and I am feeling quite on the ball this year. My runner bean germination is a little disappointing so I think I will have to sow some more and I would be grateful if anyone out there knows what I am supposed to do with 'welsh bunching onions'?? I have planted them but they were given to me...are they actually an onion or some sort of herb?? I guess I should have looked into that maybe before planting them...but then again I do like to try new things!! Well that's all I have for you today...just wanted to let you know that I am still around and not shirking all of my hobbies!! More in a couple of days! !